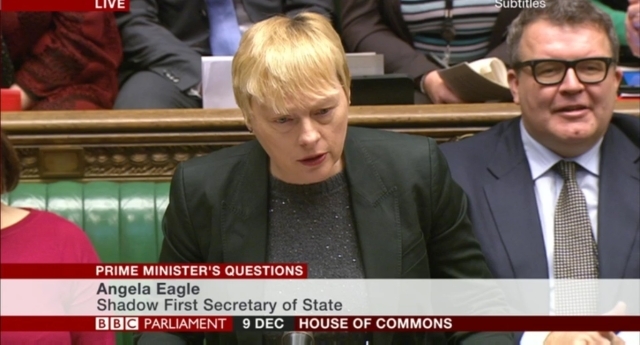 Labour’s Angela Eagle made history today – becoming the first openly gay woman to go head-to-head at the dispatch box during Prime Minister’s Questions. Ms Eagle – Labour’s Shadow First Secretary of State – stood in for opposition leader Jeremy Corbyn today at PMQs, going up against Chancellor George Osborne as the Prime Minister is on a ministerial visit to Poland. It is believed to be the first time an out MP has taken the PMQs role, and is definitely the first time an out woman has done so. She pressed Mr Osborne on a number of issues, from flooding to Europe and government cuts. The MP was praised by commentators for her competent performance. The Member of Parliament for Wallasey previously made history as Labour’s first openly lesbian MP, when she came out in 1997. She was named Shadow Business Secretary following Jeremy Corbyn’s rise to the Labour leadership earlier this year. Ms Eagle was also handed the title of Shadow First Secretary of State, surpassing Chris Bryant to become the party’s most powerful out politician – allegedly to address criticism of the lack of women in senior roles. Could Angela Eagle be the first lesbian Labour leader?